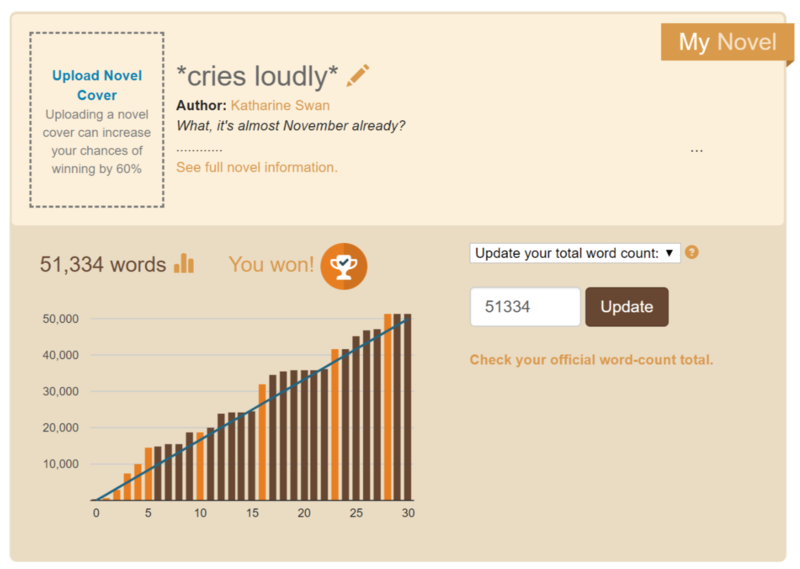 NaNoWriMo is officially over! I actually did really well this month, as you can see from my graph. 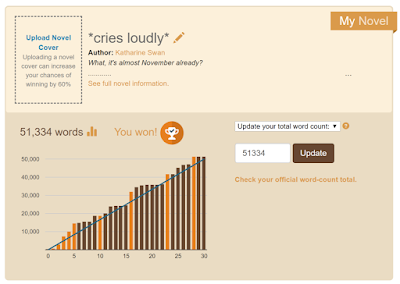 I started off the month a little behind on word count, but then I got ahead and pretty much stayed ahead the entire month. It also amuses me that you can really tell where the weekends fell throughout the month. Most of the write-ins I went to were clustered around the weekend (Friday night, Sunday afternoon, Monday evening, and Tuesday evening). I was also pleased with my badges this month. I missed the badge for updating 30 days in a row, since I decided to take last Saturday completely off (even knowing I'd miss out on this badge), as well as the donation badge (just didn't have the money this year). But I really enjoyed the process of watching the badges rack up all month. I hit 50,000 Wednesday night and didn't blog at all on Thursday. I did blog a little last night while at my last write-in of the year. Today I'm finishing up the post I started while I was there (this one) and hoping that the habit of blogging daily or almost daily will stick with me beyond November. 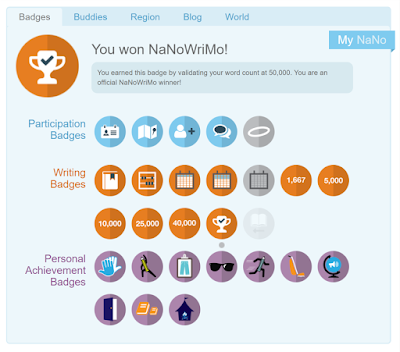 How did NaNoWriMo go for everyone else?